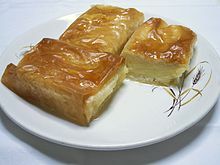 The Galaktoboureko (Γαλακτομπούρεκο in Greek) is a traditional Greek dessert. It is done with phyllo, also known as filo or fillo dough, which is filled with a custard of semolina refined with citron. It is served with syrup. Pour into a saucepan sugar, eggs, semolina and mix. Add milk, vanilla beans, keep on mixing. Finally stir in juice of half a lemon. Whisk the mixture with a fork whilst bringing it to a boil. When it starts boiling, reduce heat and keep stirring for another 10 minutes. Take the mixture from the stove to cool. Whilst cooling, spread melted butter over each sheet of phyllo. Butter a tray and cover with half the phyllo, sheet by sheet. Pour over the cooled down semolina custard and cover with the rest of buttered phyllo. Sprinkle with a bit of water and put in the stove at 356°F / 180°C / Gas mark 4 for one hour. To prepare the syrup which will be served with the Galaktoboureko: mix water and sugar, bring to boil and simmer for about 10 minutes. Stir in the lemon juice when cooled down in order to preserve vitamin C.